So exciting! 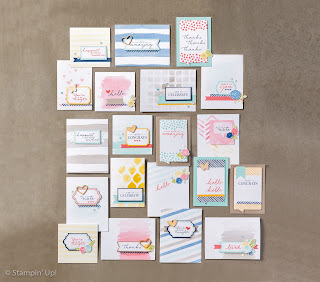 The BRAND NEW shiny Stampin' Up! Annual Catalogue is here and it is packed full of gorgeous products for you to play with! Five fabulous new In-Colors - and bang on trend - you will see these colours EVERYWHERE! You asked and Stampin' Up! listened - Christmas stamps are back in the Annual Catalogue - yay! There are seven fab sets - including the super-popular White Christmas & Wondrous Wreath from last year's Seasonal Supplement. There are 8 kits in the Catalogue - perfect for working on with a group of friends - favourites are the new Tin of Cards (LOVE the striped tin), the returning Perpetual Birthday Calendar and the much anticipated Watercolor Wishes Card Kit (released in July) which will contain everything to make 20 cards - including an EXCLUSIVE set of 12 Photopolymer Stamps. There are loads of the popular Bundle and Save 15% offers throughout the catalogue - I have counted 31 but am happy to be proved wrong on that one! Fabulous Value! Loads of fun projects ideas that include a list of the products that you need to make them - I haven't counted those! Loads of brand new Stamps in all formats, new Accessories, Ribbons, Designer Series Papers, Project Life Kits, Punches, Big Shot items ...... need I go on? Stampin' Up! is a ardent supporter of the Ronald McDonald House Charities (RMHC) and £2 will be donated from the sale of every Sprinkles of Life Stamp Set that is sold - and this set is a cracker! Not got a copy of the catalogue yet? Drop me your address to nicky.dexter@btinternet.com and I will pop on in the post. Wow! 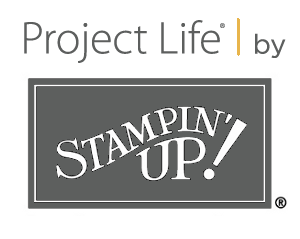 You don't want to miss out on Stampin' Up! 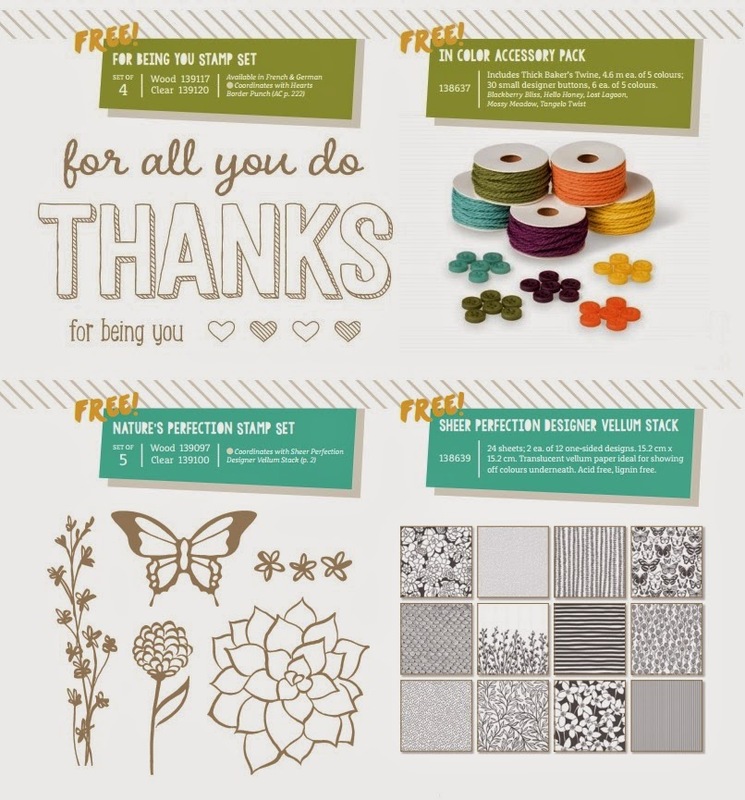 weekly deals - extra discount on a selection of fantastic Stampin' Up! products. Make sure you check my Online Store to see what’s on sale and take advantage of these great deals before they’re gone! We have been totally spoiled this week - 14 items reduced! A fantastic selection of Punches, Framelits AND the Magnetic Platform - seriously you do NEED it! Remember you can now order online - if you would like to order any of the products in this week's deals please click on the button on the right hand side and you will be whisked to my online shop where you can pop them into your basket! If you would prefer not to shop online please either email me or give me a call on 07530 368466 and I will be happy to help. 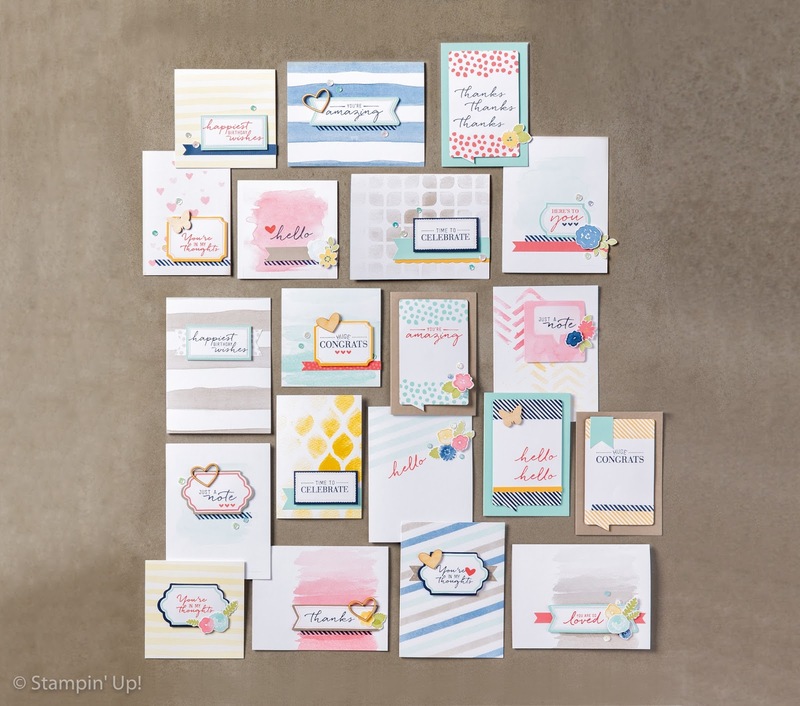 Don't miss out on Stampin' Up! weekly deals - extra discount on a selection of fantastic Stampin' Up! products. Make sure you check my Online Store to see what’s on sale and take advantage of these great deals before they’re gone! Don't forget that for EVERY £45 you spend you can choose a FREE Sale-a-bration item! Stampin' Up! Sale-a-Bration just got even better! Oooh Stampin' Up! are spoiling us this Sale-a-bration! For the month of March they have released four extra SAB products - so if you thought you already had everything - think again! For every £45 you spend with Stampin' Up! you can select a FREE item - what will you go for? 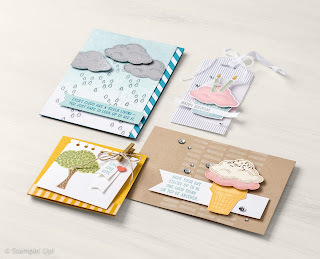 The Vellum Stack is gorgeous - I can't wait to get mine so I can share some samples with you - in the meantime here are some samples from the wonderful designers at Stampin' Up! You still have plenty of time to take advantage of all the Sale-a-bration offers. I have dates available for a party - earn even more freebies! And if your wish list is growing by the day why not think about joining as a Stampin' Up! Demonstrator? Lots of fabulous perks! Remember you can now order online - if you would like to order please click on the button on the right hand side and you will be whisked to my online shop where you can pop your items into your basket! If you would prefer not to shop online please either email me or give me a call on 07530 368466 and I will be happy to help. Each Wednesday (I am very late this week! 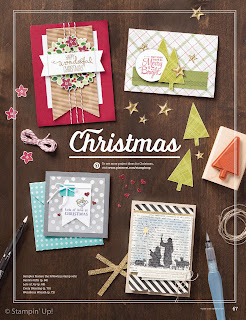 ), I will be showing you the Stampin' Up! 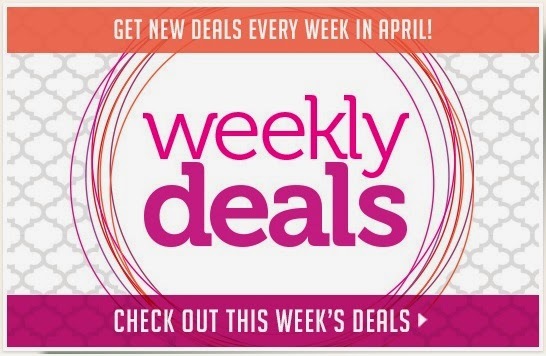 weekly deals - extra discount on a selection of fantastic Stampin' Up! products. Make sure you check my Online Store to see what’s on sale and take advantage of these great deals before they’re gone! There are several bundles in the catalogue - this is my favourite! 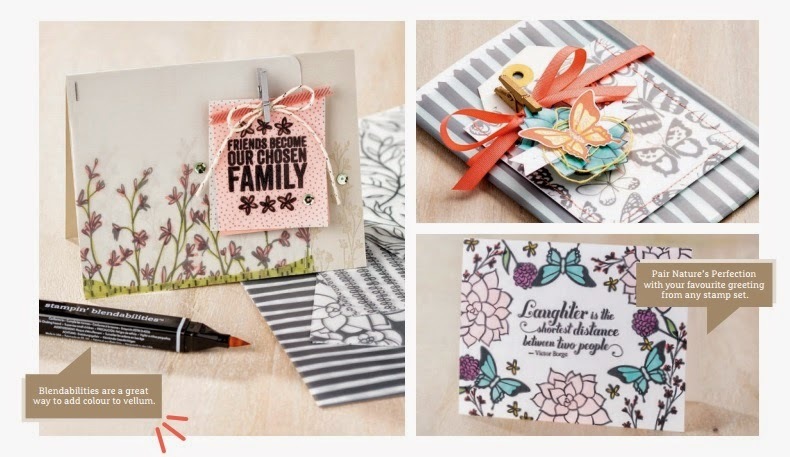 I love the detailed Butterfly Thinlits dies and the Butterfly Basics stamp set is just gorgeous buy them together and save 15%. We all went mad for the Envelope Punch Board - well here is another one to add to your collection. The Gift Box Punch Board - never buy a box again! There are five kits in the Spring / Summer Catalogue - don't forget you can choose one for FREE if you join my team! This is the Perpetual Birthday Calendar Project Kit - never miss another birthday! These will make the PERFECT gift for people - and of course you can add your birthday so they never forget it again! Stampin' Up! has split the catalogue into sections so it is easy to find what you are looking for. How lovely are these items in the Baby suite - the Baby Bumblebee stamp is adorable. I know I don't NEED another alphabet stamp set but really Sophisticated Serifs is gorgeous - I am imagining all the stationery I can make with this one. I love the fact that each letter comes in 2 sizes. So that is a very quick run through of some of my favourites! I now need to actually make something with them for you. Don't forget - with every purchase of £45 of more you will receive a FREE item from the Sale-a-Bration catalogue. 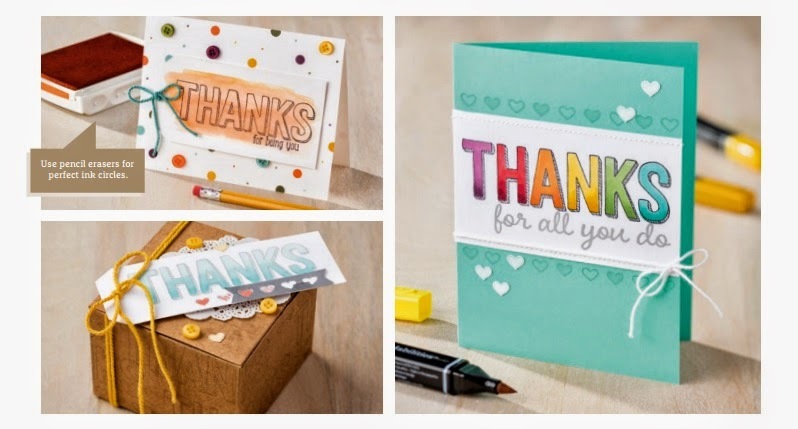 The content of this blog is my sole responsibility as an Independent Stampin’ Up!® Demonstrator and the use of and content of the classes, services or products offered here is not endorsed by Stampin’ Up!®. All images are © 1990-2012 Stampin’ Up!® All content including text, photographs and projects are ©Nicola Dexter unless otherwise stated. My artwork is shared for your personal enjoyment and inspiration only and is not intended for submission to competitions, publication or for personal monetary gain.